Watteau in the last year o his life, bi Rosalba Carriera, 1721. 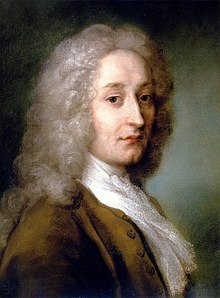 Jean-Antoine Watteau (French: [ʒɑ̃ ɑ̃twan vato]; baipteesed October 10, 1684 – dee'd Julie 18, 1721), better kent as Antoine Watteau, wis a French penter that's brief career spurred the revival o interest in colour an muivement, as seen in the tradeetion o Correggio an Rubens. ↑ Wine, Humphrey, and Annie Scottez-De Wambrechies. "Watteau" in Grove Art Online. oxfordartonline.com Oxford University Press. Retrieved 8 Februar 2014. This page wis last eeditit on 27 Februar 2018, at 02:17.